This Companion provides a definitive collection of essays on postmodern theology, drawing on the work of those individuals who have made a distinctive contribution to the field, and whose work will be significant for the theologies written in the new millennium. 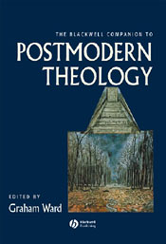 The definitive collection of essays on postmodern theology, drawing on the work of those individuals who have made a distinctive contribution to the field. Each essay is introduced with a short account of the writer's previous work, enabling the reader to view it in context. Discusses the following desciplines: Aesthetics, Ethics, Gender, Hermeneutics, Phenomenology, Heideggerians, and Derrideans. Edited by Graham Ward, one of the most outstanding and original theologians working in the field today.